Now that one of America’s great string quartets of the past, the Hollywood Quartet, is well represented on CD, it’s time to revive the others. Parnassus takes a step towards that goal by releasing the first CD of the Stuyvesant String Quartet. The disc includes famous recordings of Quartets by Hindemith and Villa-Lobos, along with a previously unpublished live performance of Quincy Porter’s String Quartet No. 7. The Stuyvesant String Quartet was founded in 1938 by brothers Sylvan Shulman, the first violinist, and Alan Shulman, the cellist. It made its first recordings, for Columbia, the following year, beginning a successful series of 20th century chamber music 78 sets which included the premiere of Shostakovich’s Piano Quintet. 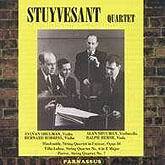 Although it played few concerts during World War II, the Stuyvesant Quartet reformed in 1945 and resumed its successful career. After recording the Villa-Lobos String Quartet No. 6 on 78s for the International label, included on the new CD (tracks 4-7), the Stuyvesant Quartet made two LPs for the Concert Hall Society. The group then started its own label, Philharmonia Records, in partnership with legendary recording engineer Norman Pickering. The Hindemith Quartet, Op. 10 (tracks 1-3), remastered from the original tapes, was recorded for that label. The recordings an this CD have been remastered from a variety of sources by the well- known audio restorer Mark Obert-Thorn. Recorded 1 November 1950, Mannes School, New York City. Norman Pickering, engineer. Parnassus Records CDs and DVDs are distributed in the U.S. by E One, in Italy by La Tosca, elsewhere by alto Distribution and associated companies. If you cannot find our CDs and DVDs, please contact us.